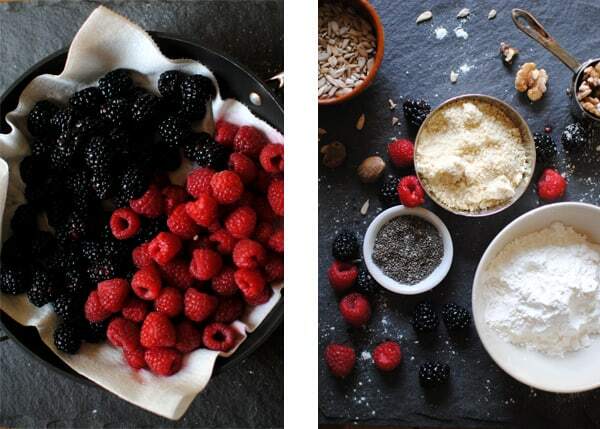 Our mixed berry crumble is packed full of berries – you can use any combination of your favorites. This vegan and gluten-free recipe is perfect as a sweet addition to brunch or post-meal dessert. The best part: This recipe is so easy, even a novice baker can ace it. There’s no dough to blind bake, nothing to roll, and the crumb topping is very forgiving. 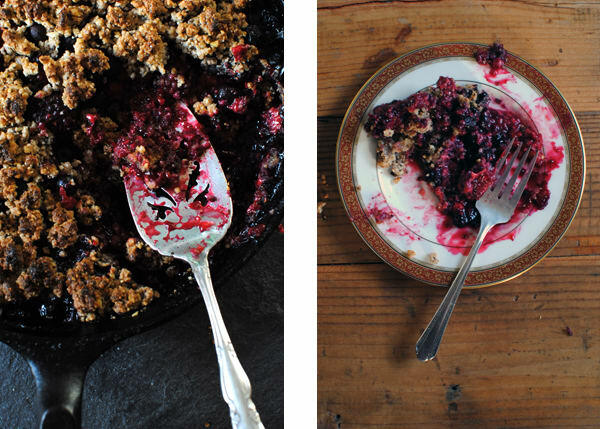 Once you’ve combined the ingredients and topped the crumble, just pop the cast iron in the oven and let it bake. Oven temperatures can vary, so you may want to check on it at 30 to 35 minutes in to see if the top has browned. If it has, remove the crumble and let it cool. 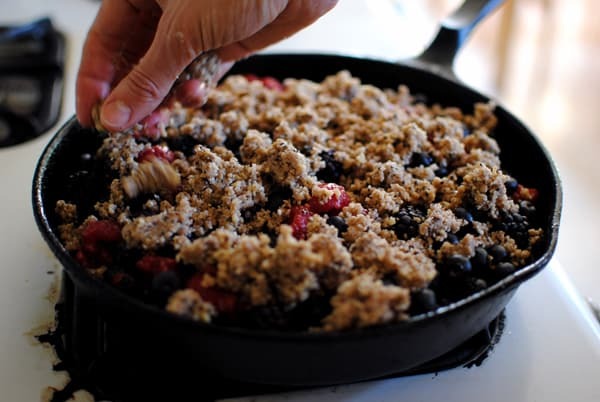 This mixed berry crumble recipe is vegan and gluten-free recipe and perfect as a sweet addition to brunch or post-meal dessert. Lightly coat a medium cast iron (or ovenproof) skillet with spray. Place walnuts, sunflower seeds, and chia seeds in food processor; pulse to coarsely chop. Do not grind into a fine powder. Add almond flour, ¼ cup arrowroot, cinnamon, and salt; pulse to blend. Add 2 Tbsp. maple syrup, oil, and 1 tsp. extract; pulse to create a crumbly mixture. Set aside. Place berries in a large bowl; sprinkle evenly with remaining ¼ cup arrowroot. Add remaining 1 tsp. cinnamon, remaining 3 Tbsp. maple syrup, remaining 1 tsp. extract, lemon juice, and nutmeg; mix well. 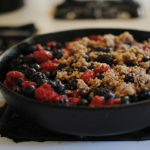 Place berry mixture in prepared skillet. Top evenly with walnut mixture. Bake for 40 to 45 minutes, or until bubbly.